Just Ask: So Long, Status Quo "No"
If I ask, I may actually hear “no”; but nothing has actually changed. I gain nothing but I lose nothing. I have what I had before asking. “No” big deal. But sometimes when I ask, I get a “yes”! Then I suddenly have more than I had before. I became an avid “no” collector as I learned that the more I asked, the more I heard “no”…and the more I heard “yes”! 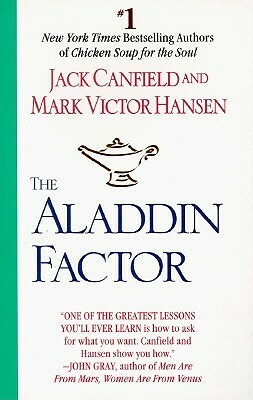 Once I got out of the team-oriented, goal-setting world of sales, however, I forgot the “The Aladdin Factor”. * I’ve not asked a neighbor for a cup of flour. I’ve bothered no one and made the 40-minute round trip to Safeway instead. * I’ve not asked a colleague how (s)he gets such a lively discussion going in class. I’ve bothered no one and allowed my classroom to become ignorantly silent, instead. * I’ve not asked church members for help after surgery. I’ve bothered no one and ended up with complications and delayed recovery, instead. The rewards of living by the “Bother No One” principle and according to its accompanying “Don’t Ask” motto are scant. I became independent (…or isolated?) I was self-sufficient (…or disconnected?) No one could call me a nuisance…or a friend. Last Christmas vacation, as I was rearranging my living room decor (8 huge shelving units full of books!) I pulled out The Aladdin Factor and decided to revive the “Just Ask!” motto. * Annemarie’s laptop hard drive failed while she was home from college. She’d backed up just before leaving, but her backup drive was at school. Would the girls’ dean go into Annemarie’s room, grab the external drive, and ship it to us? Five days before Christmas, she generously took the time to do so. * A few weeks ago, I had a doctor’s appointment in an unfamiliar part of town about 20 minutes away. I also had dry cleaning that needed to get done, and the only dry cleaner I know of is 20 minutes in the opposite direction. I hesitated e-mailing my doctor – she’s a busy lady, after all! – but decided to “Just Ask!” Could she recommend a near-by dry cleaning service? Within an hour, she’d responded, thrilled to recommend an excellent dry cleaner half-way between her office and my home…and it even has drive-up service and delivery! * Just this morning, I had to muster up the nerve to write an e-mail about a 3-day conference I really want to attend, but I have non-negotiable obligations during the 2nd and 3rd days. I’ve registered for a pre-conference workshop and would love to stay for only the 1st day of the official conference; would this be possible for a reduced fee? Within twenty minutes, I had a “yes”! The rewards of living by the “Just Ask!” principle? Well, thanks to the dean and the UPS representative, Daniel was able to get Annemarie’s computer back up and running. It took three full days, making us more grateful than ever for these two women who went out of their way to say “yes.” Without them, Annemarie would have had no computer–and no data–for third quarter. Thanks to my doctor, I have a new dry convenient cleaner that gives great service and charges reasonable rates. And thanks to a conference planner who was willing to think outside-of-the-box, I’m going to be eagerly taking notes in sessions such as “Rewired: Understanding the iGeneration and the Way They Learn,” “iBrain: The Technological Alteration of the Student Mind,” “Language and Learning: From the Age of Literacy to the Digital Age,” “Memory, Learning, and Multitasking,” “Stressed-Out Overflowing Student Brains,” and “Digital Games, Digital Learning” a week from tomorrow! The greatest reward of living by the “Just Ask!” principle is that I have so much to be grateful for.